Home Breaking Travel News Lake Como: What else? Lake Como was illuminated by stars from Hollywood to Bollywood this summer. While Italian Seaside hoteliers have seen less guests this year, and the expected summer boom didn’t happen, glitzy glamorous Lake Como had it all. 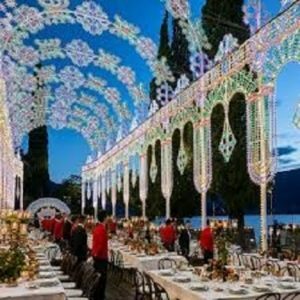 When Dolce & Gabbana put Lake Como on a world stage for 4 days at the beginning of July with a 15-million-dollar Alta Moda Extravaganza sensational fashion show on Lake Como. Invited were 300 of their best clients from around the globe, and about 50 representatives of international newspapers such as Time, The Wall Street Journal, The Financial Times, and Vogue were on the spot. The little sleepy village of San Giovanni with just a handful of inhabitants suddenly turned into fairy tale location of Alta Moda Bridal – with a seated dinner party for 300 illustrious guests on the open piazza in front of the church for the rich and famous. Actually, the Oscar Awards became nearly meaningless, and it is hard to imagine one can top that event. George Clooney arrived on Lake Como at the beginning of July to recover from his motor bike accident in Sardinia and was soon fit enough to join with Amal at the Dolce & Gabbana Extravaganza Mega Event. Later in August, Prince Harry and Meghan, now the Duke & Duchess of Sussex, arrived on Clooney Lake and were guests at Villa Oleandra in Laglio, the home of George and Amal Clooney. Spotting it was difficult, but it was said that Prince Harry played basketball with George Clooney in the hidden Parc of the Villa, while Meghan was babysitting the twins. Villa Oleandra once belonged to Teresa Heinz, widow of US magnate John Heinz III (Heinz as in Ketchup) who sold the Villa to Clooney in 2002 for US$8 million. She is the second wife of John Kerry, former US Foreign Secretary. But not only film legends arrived on Lake Como during the summer. Football Star Cristiano Ronaldo said: “In Italy, I feel like [when I’m] in Hollywood.” Together with Georgina and his son plus three body guards, he went on a boat trip to have lunch in Bellagio at the Grand Hotel Villa Serbelloni. It was one of the very rare days it rained, which makes garden owners happy, but not Ronaldo who was not much amused. Jennifer Ariston and Adam Sandler came for a three-week film shooting production of “Murder Mystery” after which the cast was seen leaving Como, Villa Olmo, Villa Erba, and Argegno blindfolded. A fake accident between a Cadillac and a Seaplane made the headlines in in the local press. But then again, Como has the oldest Seaplane School in the World – over 100 years old. A former Observation plane from the Vietnam and Korea Wars was still flying after 53 years and was recently used by another TV production for Travel Channel Poland. 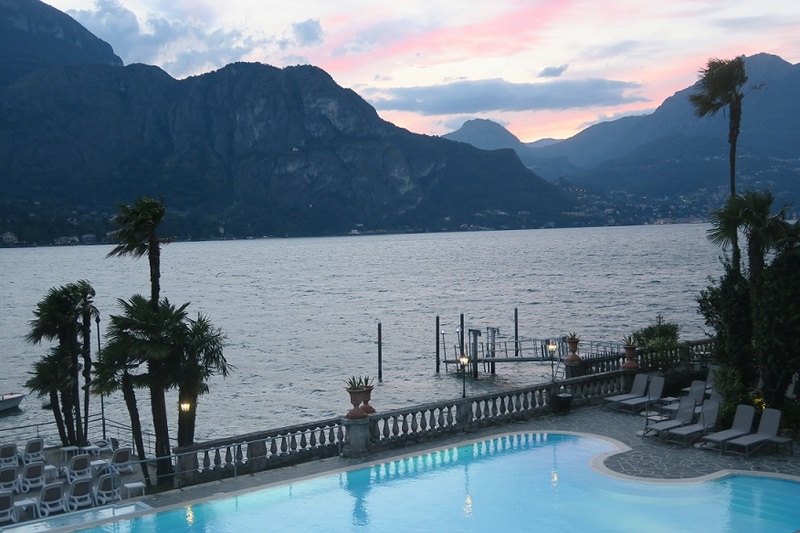 For more showbiz, “How The Other Half Lives” came to Lake Como this summer as well. British television’s most famous married couple, Eamonn Holmes and Ruth Langsford, were filming in the Grand Hotel Villa Serbelloni and around Lake Como. This Saturday, September 22, Lake Como will be the backdrop of a multi-mega-dollar engagement, blindfolding Villa Olmo which has been rented for 6 days in a row and so is the center of Lake Como Tremezzina for India’s richest man, Mukesh Ambani, and his 700 arriving guests. But who is Mukesh Ambani? Mukesh Ambani and Nita Ambani’s elder son, Akash Ambani, is all set to be wed to Shloka Mehta, the daughter of diamond merchant Russell Mehta, and the celebrations are in full swing. The Villa Balbiano in Ossuccio has 60 persons that have been working for several weeks transforming the 16th century villa, which belonged to Cardinal Tolomeo Gallio, into a most extravagant Indian luxury venue with special built piers in the front for the boats that are to arrive, because the narrow roads are not made for big limousines and hardly any parking is available. Mukesh Ambani’s luxurious 27-story Mumbai residence – Antilia – is an entire skyscraper with the private home located on the top level. OCHO RIOS, Jamaica - Jamaica's Tourism and Entertainment Minister, Dr Wykeham McNeill, has welcomed news that Palace Resorts plans to increase investment in the island’s hotel sector.